Thursday night in Oklahoma City was just game one of this highly touted Thunder season. Although the New York Knicks aren't considered to be respectable competition for the Thunder, you couldn't help but see how good they can be with just a little effort as a cohesive unit. Specifically, Russell Westbrook, Paul George, and Carmelo Anthony. All the attention, as it will be all season, was on them. More specifically, on Melo. His first game against the franchise he spent seven seasons with came early in the season and gave him the opportunity to close that chapter for good. 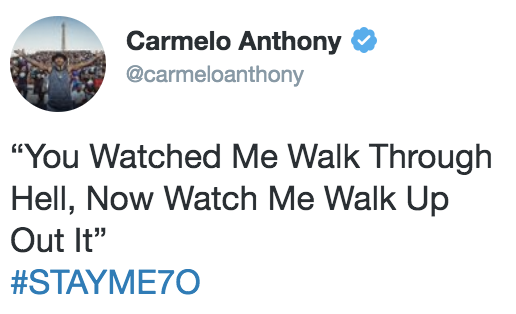 Melo's cryptic tweet had people speculating a lot, but for him, he said it wasn't pointing a finger directly at the Knicks organization, it was reflective of his previous two years as a whole. Being in OKC simply gives him an opportunity to decompress and focus on basketball. As far as the game goes, the big three (especially Anthony) had a problem shooting the ball in the first quarter, where they only shot 35.4 percent as a team, including 1-of-6 from him for only 4 points. It wasn't until the second quarter where things started to take a turn for the better. By the half, Carmelo was up to 15 points, as was Paul, and Russell was well on his way towards his first triple-double of the season with 12 points, 6 assists, and 5 rebounds. OKC led by 11 points due to a late run by the Thunder to end the half. The second half is where everyone really started seeing this big three playing better together and its clear that they can do a lot of damage on both the offensive and defensive sides of the ball. Carmelo's defense has been criticized over his 15-year career, but he's seemingly taken on that challenge this year with two other superstars that are proven to be solid defenders. Not to mention, a guy in Andre Roberson who was a top-tier defender last season. Along with Melo's 22 total points, came 2 steals and 2 blocks. There used to be a time where defense was a huge question mark for this team, but it appears as if it will be one of their strengths now. A couple specific possessions showed how well this team already communicates on defense and considering this being the first of 82 games, it will only get better. OKC's big three showed up through three quarters and thankfully, they were the last three. Combining for 71 points and 17 rebounds on 43.6 percent shooting, in what was an extremely rusty start puts the NBA on notice. This is a recipe that could result in the dethroning of Golden State as the most dominant three-headed monster in the NBA.